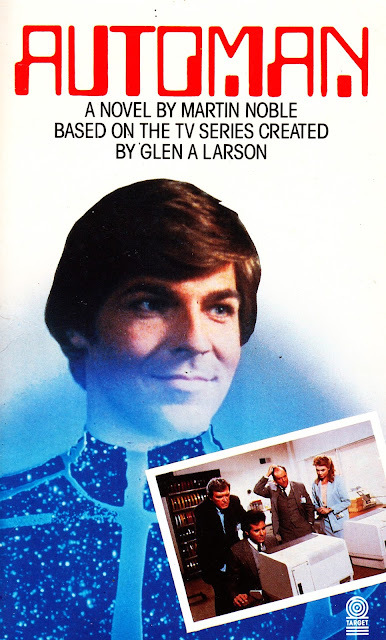 From 1984: the one-and-only novelization spun-off from Glen Larson's short-lived (but, like MANIMAL, fondly remembered) adventure show AUTOMAN. This is another of Target Book's attempts to expand their range by signing licensing deals for various US adventure shows. Amazingly, Larson doesn't attempt to claim credit (unlike the BATTLESTAR book range) for being co-author of the novel. Clearly his deal with 20th Century Fox wasn't quite as generous in the credit department as the deal he'd brokered at Universal (which saw him take credit for anything that might bring in additional monies on top of the show itself). The preposterous show swiped its inspiration and visual style from TRON (1982), which itself owed a visual debt to the conclusion of Britain's BREAKING GLASS (1980). 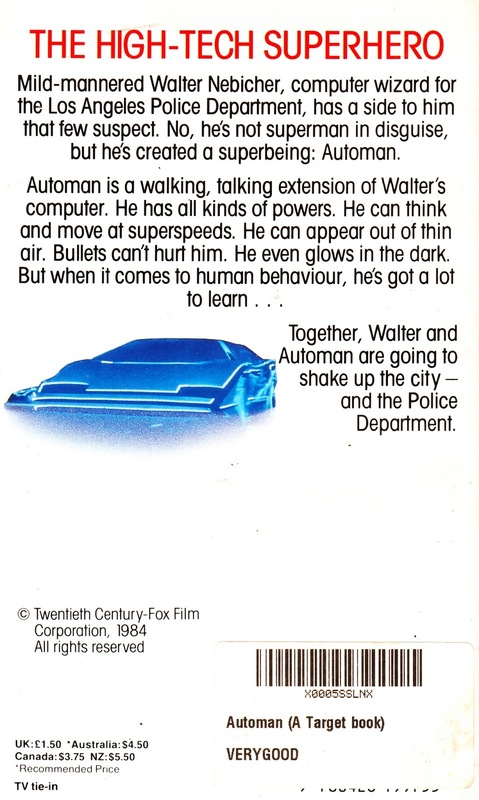 It ran between December 1983 and the following April, clocking-up only thirteen episodes including the feature-length pilot (adapted herein). The BBC premiered the pilot on 12 May 1984 and aired the final episode at the end of August. slow, how about a post on that tv times cover that tied in with the itv screening of star wars...? I have fond memories of this but, oddly enough, it's always Cursor that I remember, not Automan himself. The new previews catalog lists a book which collects all of the he-man mini comics enclosed with the toys from the 80's and 90's. This one looks like a real beauty and indeed the catalog lists it as gem of the month. reserve your copy now !